Tetra PL-5 9w Phillips UV Bulb for PUV 1500: 9 Watt Phillips UV Bulb that fits the Tetra PUV-1500 UV Filters. 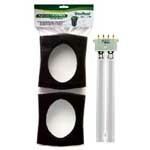 Tetra Replacement Quartz Sleeves: Protective encasing that surrounds the UV Bulb inside the Pressure Filter. If ever damaged, the UV Bulb will be exposed to water and can electrically short, or be irreparably damaged. 2 Pack Tetra Foam Blocks for Pressurized Filters: Tetra Clearchoice Replacement Foam Blocks help keep ponds clean & clear. Tetra Replacement Bio-Active Media: 2 Liter Bag of Tetra Bio-Active Media. Promotes biological filtration.